To access the configuration of the VirtualMoney component, click on the 'Options' button on the Control Panels page. In the next window, there are three tabs. 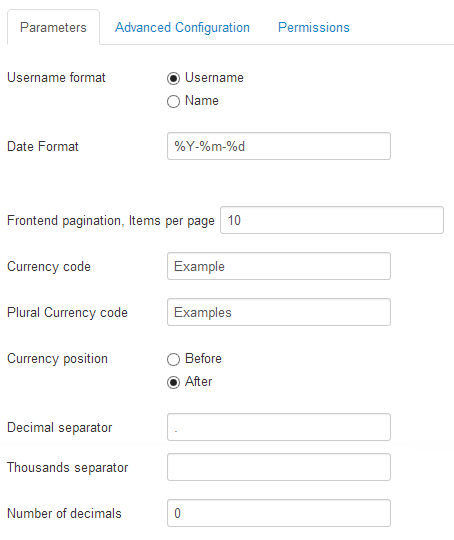 In this section, you can configure your virtual currency, as well as the date format and number of transactions displayed per page. 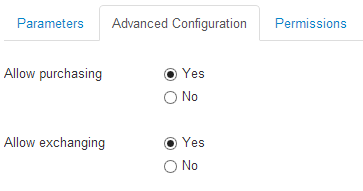 In this section you can enable or disable certain features. Payment module: This module will display a link on the home page allowing users to purchase credit packs. The 'Invoicing' component must be installed for this to work (learn more). Exchange module: This module allows user to give credits to other users. This section allows you to manage access rights of the component.